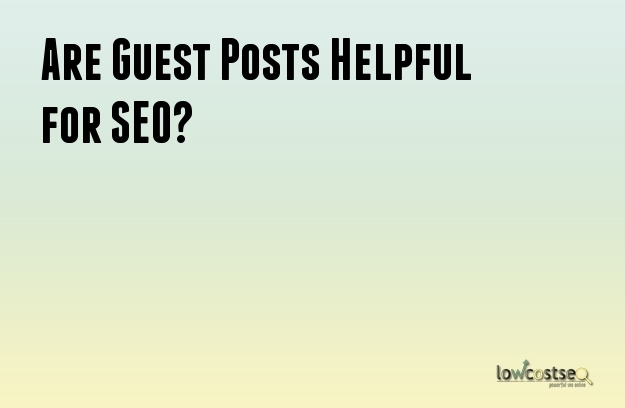 Are Guest Posts Helpful for SEO? Guest posts used to be a thing of beauty. You would identify a popular blog in your niche, offer to provide a great post for their blog, then get links to your website from an authority source plus a ton of traffic. It seemed like guest posts were the best way to quickly get high quality, relevant links to your website. As a result, guest posting quickly exploded in popularity. In the old days, writing some quality guest posts on popular blogs in your niche was enough to sky-rocket your rankings in the search engines. Blogs could go from PR1 to PR3 or PR4 in just a few months. Besides receiving natural links, guest posting was the absolute best way to improve your blog’s ranking. Years later, things aren’t as cut and dry. Google and other search engines have noticed the trend of guest posted. Unfortunately, many people are using scammy tactics in order to gain links from guest blogging. For this reason, Google and other search engines have greatly lowered the “link juice” for guest posts. They now can tell the difference between natural links in a blog post and links added in exchange for a guest post. As a result, guest posts aren’t as good for SEO as they used to be. However, they can still improve your rankings in the search results. You just need to make sure you are guest posting in a legitimate way. Search engines can easily sniff out spammy guest posts and once they notice, they will penalize your website. Guest posts are still a good use of time though. They provide a decent increase in search engines rankings and more importantly, provide traffic and an increase in authority. When you guest post on popular, authority blogs in your niche, your website will receive massive amounts of traffic. This creates a domino effect. Since your website or blog is more known, there is an increased chance that your blog will receive natural links. It’s important to focus on quality over quantity when it comes to guest posts. You should do a few guest posts on the best blogs in your niche rather than many subpar posts on lower quality blogs. When you remember this sentiment and avoid using spammy tactics, guest posting is still useful in regards to SEO. Use guest posting wisely and your website or blog will greatly benefit from it. If you are still confused about the positive or negative impact of guest blogs then contact us and we’ll help you understand the process better.